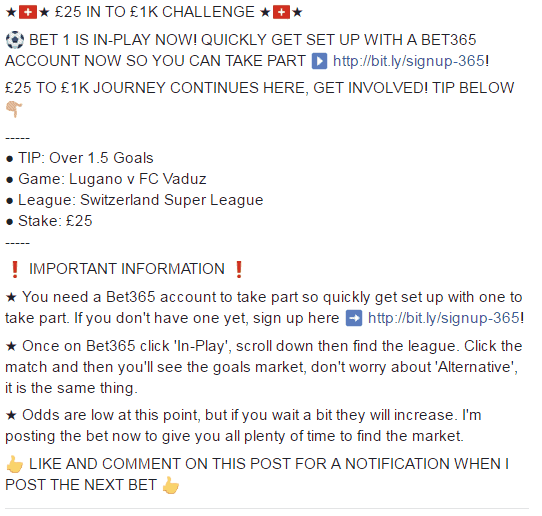 If you like to bet on sports and are on social media you will have probably noticed there are a huge amount of tipsters and challenges going on. One of the most common challenges is to take a relatively small amount of money say £10 and attempt to turn it into a £1000. This is done by rolling over your stake with each bet until a profit of £1000 is made. Challenges like these have become very popular with a number of these pages having hundreds of thousands of followers. Now I understand why these challenges are popular its like buying a lottery ticket. You have a small initial layout with the potential for a big win. One big thing a lot of these tipsters and pages fail to mention is they want you to lose. This is how they make money. The business model for these twitter tipsters or facebook pages is to make an income as a bookmaker affiliate. Enticing new customers and being given a share of their losses is where their profit is made. Normally it will be between 10-30% of a referred players losses. Whilst they might “boom” every winning tip and tell you they have made thousands in the past two weeks. Over the long term they only make money if you lose. Do you really want to follow betting tips from someone that profits only if you consistently lose? Seems like that would be a bad idea. You will consistently see these types of tipsters pushing bookmaker sign ups. Claiming big profits whilst never recording past results and highlighting wins but barely acknowledging losses. In conclusion following these types of challenges and tipsters is not going to make you money in the long term. Possibly you could get lucky and turn £25 into £1000 or you might go on to lose £2500 by following a 100 of these challenges that don’t come off. The only people that are making money from these challenges are the guys running these twitter accounts and facebook pages. Not the people following them. Is it possible to make money from sports betting? So can you actually make money from sports betting? Yes you can but it isn’t as easy as following some dude who says he will turn £10 into a £1000 in 10 bets. It is said that only 1% of people betting on sports make a profit. If you compare the popularity of these tipsters and pages to the small amount of people following websites/blogs that give out solid sports betting advice. It’s easy to why the overwhelming majority of people lose money betting. If actually making money from sports betting and trading does appeal to you. An effective and profitable approach to take is matched betting. I have written an article detailing how to make money from matched betting here. This approach uses bookmaker promotions to guarantee a profit. There are hundreds of these offers available and if you are looking to make some extra money this is a great way to do it. It is probably the most consistent way to make money from sports betting. Something else you may want to consider is looking into betting exchanges and sports trading. 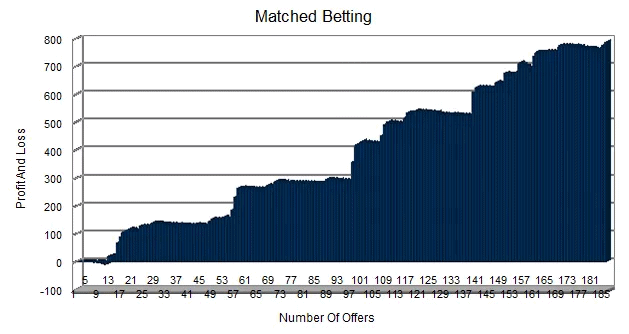 I have outlined how betting exchanges function is this article. In general they will offer you much better odds. They differ to bookmakers as they don’t make money on player losses. Rather they take a commission on winning bets or stakes which means that they also don’t ban winning accounts. Please share this article if you know people that are following these shady social media tipsters. So at least they become aware they are betting on the advice of people that want them to lose. If you want to start profiting from sports betting and trading. I recommend this service which currently contributing the biggest profit in my 50k in a year challenge. Why don’t we just lay all their tips, would we make a profit then. You can’t lay at the same odds these tipsters advise. Also there is exchange commission to take into account.